I love them. They fit perfectly and comfortably. This is a comfortable boot that can go from office to evening. Slips on/off easily and has a cushioned sole which feels nice on the feet. The boot is a bit on the long size. If you're in between sizes, I'd probably recommend going a half size smaller. Comfortable and good grip on snowy or wet ground. This boot is super comfortable and looks good with almost any pant. I was looking forward to these boots with all of the good reviews and fairly true to size. Unfortunately, mine are way too large - nearly two sizes. Disappointed that I will not be able to wear these and will have to give them away. It's not that I don't expect quality from a CH shoe/boot, but sometimes ordering online can be intimidating. I have issues with right foot that cause pain with about any shoe. So to get these and they fir so perfectly, I was pleasantly surprised. And they look fantastic - more than expected as well. I LOVE these Gray boots and so glad I purchased them! I am a surgeon and wear these boots in the operating room. They are truly waterproof and clean off easily while still looking outstanding. They are similar to Danskos for standing but even more comfortable for walking. I do recommend investing in the edge polish, too, to keep them looking their best. Already fan of Chelsea Boots, and the grey is a distinct look I haven't seen elsewhere. The style and color are great. Appears to be a very classy boot from a great company - and the reviews were positive. I own a number of C-H boots and shoes and believe these will be the same exceptional quality. it looks good and easy to wear on. I have a number of Cole Hann shoes, all size 7, all fit perfectly. This boot feels super loose on me at size 7, especially in the rear. Is this normal for a Chelsea boot? Or should I be buying boots that are smaller than shoe size? (In which case I'm out of luck because they don't make these smaller than 7). BEST ANSWER: f you scroll down to the Customer Reviews tab beneath the product and customer photos, you can usually find some good information there regarding fit. Also, we recommend using the TrueFit widget on the product page. Does the ankle (elastic) strap part waterproof as well? BEST ANSWER: The stretch elastic panel is a tightly-woven material that is water-resistant but not specifically treated to be waterproof. Great question. I don’t know, it seems to be fine when I wear them. BEST ANSWER: Try putting some baking soda on it to soak up the grease, for a few hours or overnight. Then clean with light soap and water (maybe just get away with water as well). If I wear a size 9 shoe, what size should I get? BEST ANSWER: I actually found these boots to be slightly long. I usually get a size 11 in Cole Haan, and I probably could have done 10.5 on these boots. The size of the shoes are true. I wear a 9.5 US and I order from Cole Haan a 9.5 US. The fit is perfect! I wear and purchased size 10.5, and the boots fit perfectly. They are extremely comfortable. You should get the same size. Iget the same shoe size and it fit great! 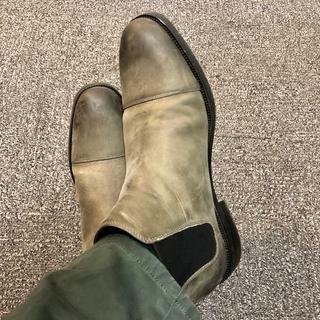 im a size 8.5 M in cranston chukka boots, should i get same size for these chelsea boots? BEST ANSWER: Yea. same size. BEST ANSWER: The Wagner Grand Waterproof Chelsea Boot is a current style and is still available online. If your size is sold out, you can try an online search to find possible availability at our retail partner stores. Use quotation marks: "Cole Haan Wagner Grand Chelsea Midnight Gray". What is your return policy if the Boots do not fit?